Yes, it does demand eternal vigilance. 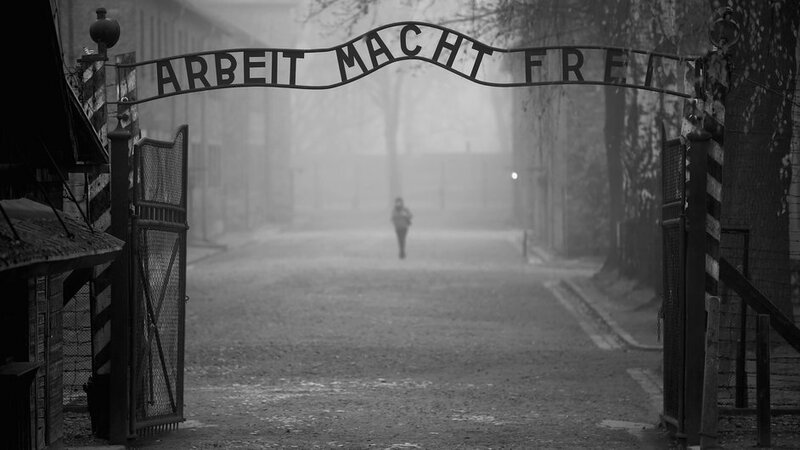 The gates of Auschwitz—with their demonic jeer, “Work Makes You Free”—led to history’s vilest demonstration of everything freedom isn’t. It didn’t turn out that way. So impoverished was the Soviet empire that it couldn’t give its subjects the bread and circuses that pacified imperial Rome’s populace; so, to the cheap vodka drastically shortening Russian life spans, it added lascivious license. Drunken stupor; moments of voluptuous rapture: that’s escape, not liberty. It’s a strangely inspiring story: even in prison, with blood on one’s guilty hands, one can maintain an inner freedom and integrity. At least then; at least in America. But is this proposition universally true? At some minor traffic tangle outside my door one day, I grumbled, “Damned Communist mayor.” “What do you know of Communism?” objected my Albanian doorman, once a music teacher. What, indeed? My most vivid insight comes not from experience, or even from Solzhenitsyn, but from The Lives of Others, the 2006 movie that laceratingly dramatizes how East German tyranny, with its spying and informing of all upon all, deformed every personal relationship, tainting love, friendship, and loyalty, until it corroded each individual soul and left a rust of self-loathing in those made to conspire in their own oppression. It proved possible to enslave not just the body but the innermost self. To follow after knowledge and excellence. You were made men. That’s Ulysses, as Dante makes him speak, crystallizing the very heart of Western civilization, from classical antiquity to the Christian Middle Ages and beyond—the ideal that the Nazis, antihuman Übermenschen subjugating subhuman slaves whose only escape was “by way of the Chimney,” succeeded in trampling for a blood-drenched interval in civilized Europe’s center, not in some remote, myth-shrouded era but in the lifetime of this elderly writer. To understand the knowledge and excellence whose pursuit, Dante says, defines humanity requires understanding its opposite, its starting point: the fact “that man, the human species—we, in short—had the potential to construct an infinite enormity of pain,” to use Levi’s words once more. And yet . . . he liked his Château Margaux and his Château d’Yquem, served to him by his almost invisible “servants” and paid for by fast-squandered wealth wrung from the sweat of their brows. He liked his perfect house atop his “little mountain,” whose bricks were baked by slaves, as were Pharaoh’s in Egypt. He liked, we think, to sleep with his pretty slave, the three-quarters-white half-sister of his beloved dead wife. He liked the gourmet dinners cooked by her enslaved brother, whom he’d had trained as a chef in Paris. And perhaps this guilty disjunction between belief and behavior helps account for his almost gleeful embrace of the French Revolution’s violence. God’s exterminating thunder has to annihilate somebody, somewhere, for oppression of the ruled by tyrannical, boisterous rulers, Jefferson felt from his own experience. Why not the French—even if the guillotine beheaded the mother- and sisters-in-law of George Washington’s beloved aide-de-camp, the Marquis de Lafayette, author of France’s original Declaration of the Rights of Man and the Citizen, which Jefferson edited at Lafayette’s own dinner table? After all, Jefferson wrote insouciantly, “The tree of liberty must be refreshed from time to time with the blood of patriots and tyrants.” Why not all of Europe, once Napoleon decided to export the French Revolution? Rather than see the Revolution fail, pronounced Jefferson, with totalitarian zeal, “I would have seen half the earth desolated. Were there but an Adam and an Eve left in every country, and left free, it would be better than as it is now.” Half the earth; and Jefferson luckily was dead when the fateful lightning of His terrible swift sword was loosed in America, as Jefferson rightly feared must come to pass. Well, there were many Jeffersons; and beside the slaveholder and the radical, who should make us wonder if extremism in the defense of liberty really is no vice, is the Jefferson we justly revere: the man who never mentioned on his tombstone that he’d been president of the United States but rather boasted of being “author of the Declaration of American Independence, of the statute of Virginia for religious freedom, and father of the University of Virginia.” Those things, Jefferson understood profoundly, best nurture that pursuit of knowledge and excellence that Dante says makes us men. “Truth is compared in Scripture to a streaming fountain,” wrote Milton. “[I]f her waters flow not in perpetual progression, they sicken into a muddy pool of conformity and tradition.” That idea undergirded Jefferson’s passion for the University of Virginia, whose breathtakingly beautiful campus and buildings he designed, whose curriculum he prescribed, whose professors he hired (omitting one for theology), and whose board he presided over until his death. “This hobby of my old age,” he wrote (prefiguring such Victorian sages as Matthew Arnold and John Stuart Mill), “will be based on the illimitable freedom of the human mind to explore and to expose every subject susceptible of its contemplation.” Who knows what progress and discoveries eager young minds exposed to the best that has been thought and said, free to argue fearlessly under the guidance of liberal-minded teachers and finally to judge for themselves, will make in their later careers? So much progress has occurred since mankind emerged from barbarism, Jefferson wrote, that no one can foresee its limit. And we who live in an age when human ingenuity is the most valuable natural resource of all—when intellect creates more of the value of our computers and smartphones and medicines and even cars than does the inert matter that goes into them—have all the more reason to echo his sentiment and protect that illimitable freedom of the human mind that has given us such gifts. Still, at the end of his life, Jefferson had to come down from his mountaintop to reprimand his pupils for their drunkenness, abuse of professors, and loutishness; and when he tried to speak, he wept, grief-stricken over the grotesque disjunction between his dream of reason and adolescent reality. Most American campuses today would make him weep, too. College speech codes, only gradually fading from fashion, or “trigger warnings” that one or another classic book might cause a twinge of offense to the sensibilities of today’s coddled students, or students’ refusal to listen to speakers who might express ideas with which they don’t agree—here is the militantly ignorant negation of Jefferson’s “illimitable freedom of the human mind to explore and to expose every subject susceptible of its contemplation.” Worse still is the mindless orthodoxy that passes for intellectual life on today’s campus. Do colleges offer illimitable freedom to explore whether there might be differences in the minds of men and women that make them excel at different academic subjects, or that there may be no out-of-the-ordinary global warming caused by human activity, or that mankind’s fate might require that marriage be defined as between a man and a woman, or that affirmative action and welfare might harm and degrade their supposed beneficiaries, or that Islam may not be a religion of peace, or that environmental cleanliness may not be man’s highest value, or that moneyought to speak in politics, or even that all lives—not just black ones—matter? Here the fountain of Truth has indeed sickened into a muddy pool of conformity and tradition, as Milton knew such unthinking dogma as political correctness ensures. Thomas Jefferson, proud of furthering the freedom of conscience and thought inseparable from political freedom, well knew the evil of holding in slavery men endowed with the right to liberty. And to take only one of many examples of loutish mistreatment of professors (omitting the resignation of the University of Missouri’s president in response to a threatened strike by the football team): Jefferson would feel only revulsion at the hysterical Yale sophomore recently filmed screaming obscenities at her housemaster and demanding he resign for defending his wife, a lecturer who had “insensitively” suggested that if students didn’t like someone’s Halloween costume, they could “look away, or tell them that you are offended. Talk to each other. Free speech and the ability to tolerate offense are the hallmarks of a free and open society.” Of course, Jefferson’s generation of college students may have thought it childish to don Halloween costumes. Mine did. As for exploring every subject susceptible of contemplation, did Jefferson have in mind such courses in English literature listed in, for instance, the Haverford College course catalog (where I find no course in Shakespeare or Chaucer) as “Cruising Home: Queer Kinship in Theory and Practice,” “Literature, Popular Culture, and the American Left,” and “Advanced Topics in Peace, Justice and Human Rights”? In history, a Haverford student can study “Insanity” or “Political Technologies of Race and the Body”; but this year, he won’t be offered “Sport and Society” or “The Early Republic,” which I devoutly hope (but do not feel certain) will cover the American Founding when the college offers it again. As for what college students know of every subject susceptible of contemplation, a hilarious film, Politically Challenged, that Texas Tech students produced does not reassure. To the question of “Who won the Civil War?” 11 students had no idea, though two thought it might have been the South, one suggested “America,” two didn’t know who fought it, and one wondered if the questioner meant the one that occurred in 1967. Only one answered, “The North; the Union.” Only one of nine students could name the current U.S. vice president. None of five students knew from whom America gained its independence, though one thought it might have happened in the 1970s—or else the 1670s. But all of them knew the names of actor Brad Pitt’s current and former wives and that “Snooki” was a character on the TV show Jersey Shore. Having to advise the public, may speak free. In that spirit, Jefferson’s Declaration of Independence heralded a new kind of government, in which men would live under laws that they themselves had made. But he believed, along with his fellow Founders, that educated citizens would be the key to such a government—not intellectuals, professors, or geniuses like Milton but merely people who understood the difference between liberty and tyranny, who knew from the Bible or history books or family traditions or their own experience of the countries from which they’d escaped that tyranny has been the deplorably ordinary condition of mankind. Jefferson and George Washington strongly supported public schooling, which the 1650 Connecticut legal code required, and all the Founders envisioned citizens who read newspapers, freely discussed public men and public measures, made up their own minds, and voted accordingly. With their clear-eyed skepticism about human nature, knowing that passions and interests motivate men more often than reason does, the Founders had no fantasies about a nation of toga-wearing Athenian philosophers, but they did envision a republic of practical-minded people pursuing their own happiness and self-improvement (Dante’s pursuit of excellence), while jealously guarding their right to govern and think for themselves. Benjamin Franklin’s purported reply to Philadelphia socialite Elizabeth Powel’s question, as the 1787 Constitutional Convention concluded, as to what kind of government the delegates had created is famously equivocal: “A republic, madam—if you can keep it.” By the early 1830s, Alexis de Tocqueville, touring Jacksonian America seemingly with a Sherlockian magnifying glass and ruminating over Madison’s worries about the tyranny of the majority in Federalist 10, began to grasp how profoundly challenging Franklin’s reply had been: historically, republics had not been long-lived. Already, the young Frenchman noticed troubling currents in American culture that ran counter to the Founders’ spirit of liberty in thought and action. “I know of no country in which there is so little independence of mind and real freedom of discussion as in America,” he pronounced—the result of a culture of intellectual conformity that needed no physical coercion, as visitor Charles Dickens also noticed a decade later. “The majority lives in the perpetual utterance of self-applause,” Tocqueville remarked, noting: “The smallest reproach irritates its sensibility, and the slightest joke that has any foundation in truth renders it indignant.” Try an anti-PC joke at Columbia or Wesleyan, if you want to feel a smile freeze on your face. Prophetic words, for in fact, America lives under that gentle servitude and has done for decades, without really noticing and without understanding how it happened. Woodrow Wilson, believing that the Founders’ checks and balances merely gummed up the efficiency of government, set out to replace their Constitution and the “nonsense [they] talked about the inalienable rights of the individual” with a “living constitution,” reshaped daily “with boldness and a touch of audacity” by “judicial interpretations” that would be ever “more liberal, not to say more lax.” He aimed to replace government by laws that the people themselves had made with government by disinterested, nonpolitical experts in executive-branch administrative agencies, furthering the common good by modern social science’s light. What Progressivism began, the New Deal completed, through an alphabet soup of agencies, from the NLRB to the FCC, that routinely overturn the Constitution’s separation of powers by making rules, enforcing them, and adjudicating transgressions. “The practice of creating independent regulatory commissions, who perform administrative work in addition to judicial work,” Franklin Roosevelt confessed, “threatens to develop a ‘fourth branch’ of Government for which there is no sanction in the Constitution.” Worse, not only does the Constitution give Congress no power to create mini-legislatures and mini-courts, but administrative-agency adjudications—lacking grand-jury indictments, petit juries of one’s peers, and even the presumption of innocence—abolish the due process of law. The 1946 Administrative Procedures Act ultimately codified all this; it is now, in effect, our real but almost invisible constitution. (See “It’s Not Your Founding Fathers’ Republic Any More,” Summer 2014.) You don’t like the “network of small, complicated rules” that tie down your company like Gulliver and threaten to put you out of business? The problem isn’t the regulations but the undemocratic and unconstitutional order that hatched them “under the wing of the sovereignty of the people”—an order as gently despotic as the EU’s welfare-state bureaucracy, with its plague of paralyzing rules. History doesn’t repeat itself, an old adage holds, but it rhymes. So it’s not Nuremburg rallies or Hitler Youth leagues that I fear but the entropy of our beliefs and institutions. Self-government by know-nothings, the soft tyranny of unaccountable apparatchiks: each dismays—especially when one sees bureaucratized Europe too enervated so much as to have babies, so that Portuguese schools close by the hundreds and whole Spanish villages lie abandoned and decaying. Nor do these countries sufficiently value the Western liberal culture that they inherited from the classical world—the knowledge and excellence that makes us men—to shelter it from the neo-medieval obscurantism of the Islamic hordes that Europeans bloodily stopped by force of arms at the gates of Vienna in 1683 but whom they subsequently admitted by the hundreds of thousands, without bothering to ensure that they would live in Europe (and in Britain) as Europeans, valuing the modern liberal culture that Europe itself had long taken for granted and carelessly allowed to shift for itself, while it nurtured the soft despotism of the bureaucratic welfare state—with its dependence, its “fairness” that Madison used to call the tyranny of the majority, its indiscriminate tolerance too value-free to judge between better and worse, and too deluded about human nature to know that people might want to construct an infinite enormity of pain and to kill you, despite all your caring good intentions. These delusions are fatal delusions, as we have just seen in Paris. It is a fatal conceit to believe that we have reached, or ever can reach, the end of the millennia-long pursuit of enlightenment and virtue that has created the West’s magnificent civilization, whose capstone is most certainly not the bureaucratic welfare state, despite what Kant, Hegel, or (closer to our own time) Fukuyama may tell us. As the sun began to set on a day of conventionally uplifting tourism in Chartres, after a drink in a sidewalk café opposite the storied cathedral in which we had spent so many hours of awestruck admiration, my son and I crossed a beautiful square toward our car. But dusk was transforming the picture-book town, as the teenage Muslim loubards in sneakers silently converged on the square, and police cruisers prowled its pedestrian paths. Who knows but one of those kids might have been the now-29-year-old French Muslim from Chartres, among the three gunmen who just massacred a theaterful of other young people in Paris? What made them do so, and what will keep the magnificent cathedral from becoming a mosque, as did Hagia Sophia in Constantinople? Western civilization arose on why. We had better keep asking it, draining every fetid pool of political correctness that lies in the way of an answer. This entry was posted in Articles, Publications and tagged Alexis de Tocqueville, Areopagitica, City Journal, Dante, Democracy in America, Freedom of Speech, James Madison, John Milton, Lincoln Steffens, political correctness, Primo Levi, Survival in Auschwitz, The Lives of Others, Thomas Jefferson. Bookmark the permalink.